Membership with The Beryl Institute provides access to the largest source of patient experience resources that will support you in leading a positive patient experience effort for your organization. Membership toolkits include targeted content to help you support the continued development of specific roles within your organizations. The toolkits provide focused resources, learning and connection opportunities for those that help contribute to a positive healthcare experience. How will The Beryl Institute membership benefit you in your current position? 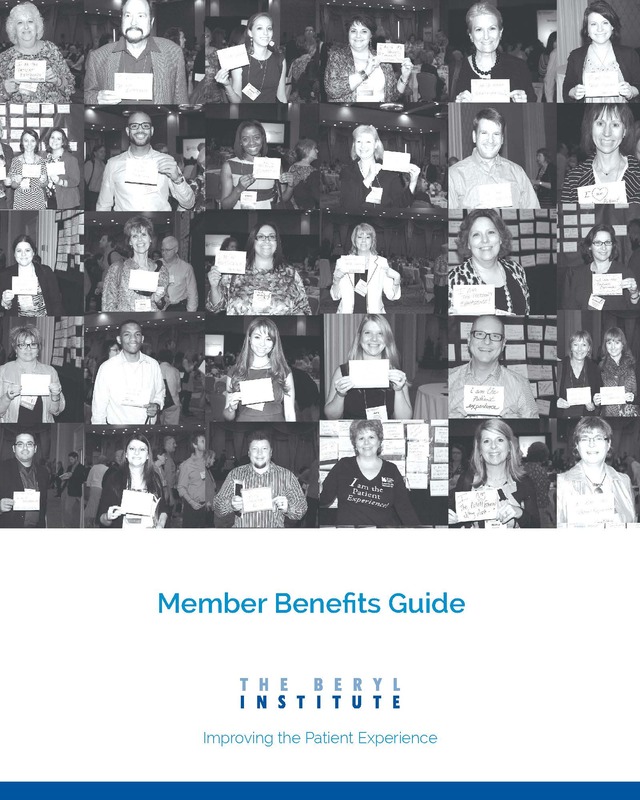 How will membership in The Beryl Institute in turn benefit your institution/organization? Which member benefits/resources do you plan to take advantage of? Cite specific examples whenever possible to strengthen your argument to your employer and organization. We have also provided sample letters to your supervisor that you can customize to fit your needs. We are here to help you take advantage of the wealth of patient experience resources and benefits available to you as a member. Download this brochure to explore the patient experience resources that are available with membership. We invite you to join today! For questions, please contact Michelle Garrison at 866.488.2379 or at michelle.garrison@theberylinstitute.org.